Jacqueline Harpman was born in the Etterbeek section of Brussels, Belgium. Her father was a Dutch-born Jew, and the family fled to Casablanca when the Nazis invaded Belgium in World War II. They returned to Belgium after the war. After studying French literature at the University of Brussels, she began training to be a physician, but could not complete her medical studies after contracting tuberculosis. She turned to writing, and after publishing some short stories, published her first novel, Brève Arcadie, to critical acclaim in 1959. In 1980, she qualified as a psychoanalyst. She gave up writing novels after her fourth book was published, but resumed her writing career 20 years later. She produced about 12 novels and won several literary prizes, also serving on the jury for the prix Rossel, one of the most important in Belgium. She was married an architect and had two children. 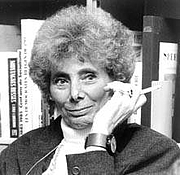 Jacqueline Harpman is currently considered a "single author." If one or more works are by a distinct, homonymous authors, go ahead and split the author. Jacqueline Harpman is composed of 6 names. You can examine and separate out names.